Misschien een gedateerd bericht maar wilde jullie het niet onthouden. Porsche South Africa heeft het Kyalami Grand Prix circuit gekocht, waar tot twintig jaar geleden Formule 1-races werden gehouden. Het circuit is gebouwd in 1961, net buiten Johannesburg. In 1967 vond de South African Grand Prix er plaats. Daarvoor werden de Afrikaanse F1 races (waarvan de eerste op 29 december 1962 plaatsvond) op het circuit East London verreden. Kyalami was de Afrikaanse thuisbasis voor de Formule 1 tot en met 1985. De race van 1981 was geen kampioenschapsronde, maar werd gereden als 'Formula Libre', omdat de FISA (voorloper van de FIA) en de FOCA (organisatie voor constructeurs) ruzie hadden. In 1985 protesteerden enkele merken tegen de apartheid die toen nog in het land was, door de race te boycotten. Hij werd wel verreden, maar met minder deelnemers. In 1985 kondigde toenmalige FIA-baas Jean-Marie Belestre aan dat er in de toekomst geen race meer zou zijn in een land met apartheid. Nadat de apartheid in 1990 werd afgeschaft, keerde de race in 1992 terug naar het circuit. Toch duurde de terugkeer niet lang. De laatste Formule 1-race werd in 1993 op het circuit gereden. Het organiseren van een F1-race bleek te duur voor de nieuwe eigenaar, de South African Automobile Association. Van 1998 tot 2002 en in 2009 en 2010 werd het circuit gebruikt voor een ronde van de Superbike World Championship. De minimumprijs van het circuit stond op 200 miljoen Rand, omgerekend zo'n 14,1 miljoen euro. De verwachting was dat de prijs snel zou stijgen, maar toch eindigde de veiling al na zestig seconden toen de prijs op 205 miljoen Rand (14,4 miljoen euro) was blijven steken. De winnende bieder was Porsche South Africa. Wat de importeur met het circuit precies wil gaan doen is nog niet bekend. Wel wil het bedrijf het circuit intact houden, eerder was er sprake dat projectontwikkelaars de grond wilden gebruiken voor appartementen. 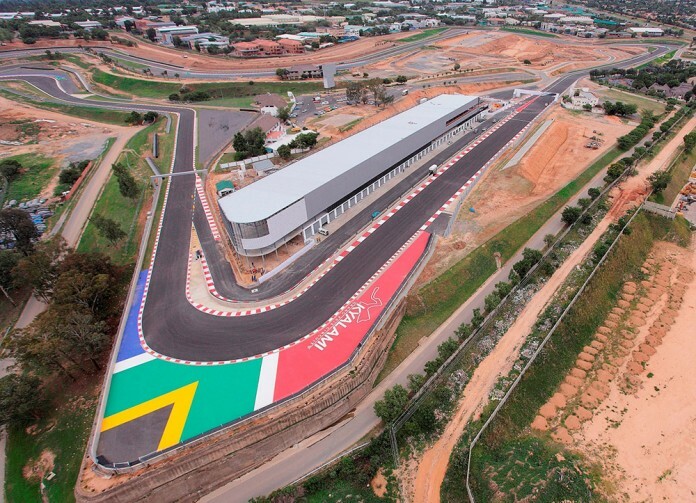 The revamped Kyalami racetrack in South Africa is "close" to being compliant with Formula 1 standards, according to circuit developer Andrew Baldwin. South Africa has not hosted a F1 race since 1993 but Kyalami has since undergone extensive renovations to bring it back up to standard. A redesign and update of the now 2.81-mile circuit has been completed with significant upgrades made to the safety features. "We have a track which is close to being compliant for F1," said Baldwin, group property manager for Porsche SA and Kyalami. "There are a couple of areas which maybe would have to be changed. "We have engaged with [FIA race director] Charlie Whiting from an approval point of view. He came to see us last year. "We're working towards FIA grade 2 accreditation, which means everything except F1. We can do F1 testing here. "We have gone all out on the safety features, including upgrading the guardrails, all debris fencing and all the gravel traps. "So in terms of safety, we have a very compliant racetrack and when we're finished, we'll get Charlie back and maybe we'll talk to him then." Baldwin concedes that a imminent return of F1 is not on the agenda considering the amount of funding that would be required. "The challenge is the business model, in terms of finding the money to bring F1 to South Africa," he said. "I can't see it at the moment, but never say never. We'd love to see F1 back in Kyalami." When asked what would be required to bring a grand prix back to the country, Baldwin said: "We would need government support. It's the only way, as proven in other countries. "They are aware what we're doing, but I can't say we've had any formal discussions." Kyalami general manager Dennis Klopper said the primary categories the venue is targeting are "GT racing, touring cars and maybe WEC". 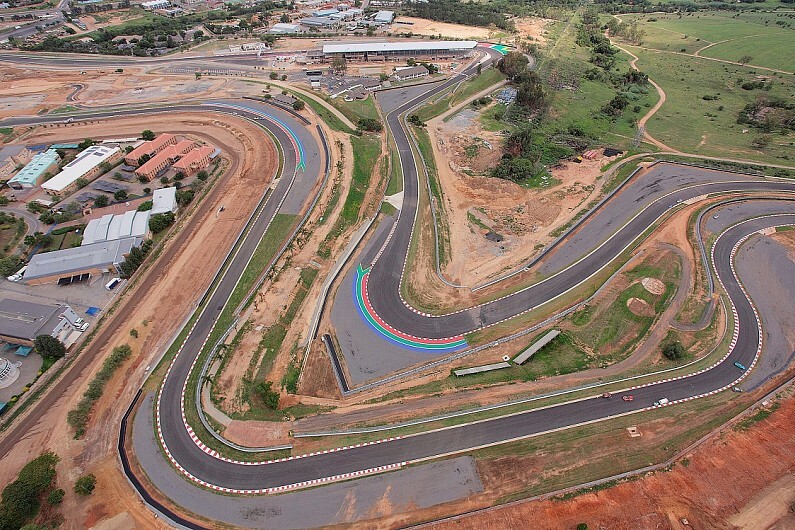 Kyalami Grand Prix Circuit – The Legacy Continues. 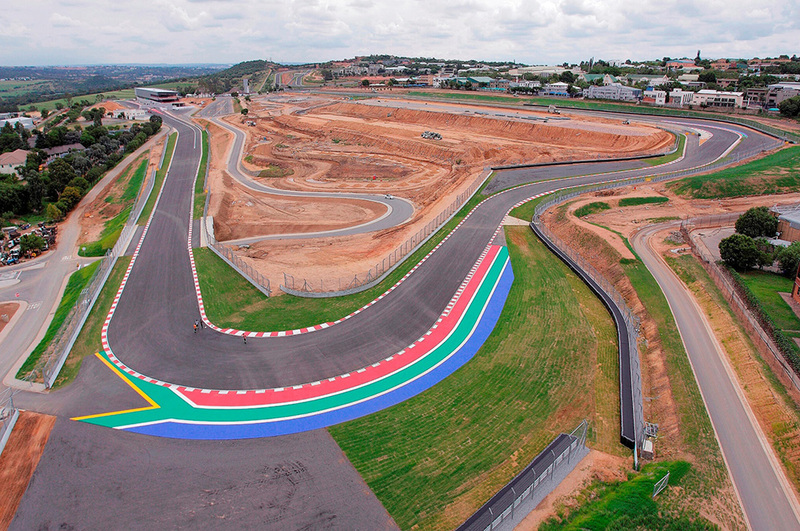 Extensive construction at the Kyalami Grand Prix Circuit, which includes a complete refurbishment of the iconic track, as well as changes to the layout, commenced in May 2015. Work at Kyalami (meaning ‘my home’ in Zulu) continues on the pit building which now incorporates the new International Convention Centre. Outdoor exhibition platforms, a dynamic driving area as well as the handling track are also undergoing construction. Project completion is scheduled for mid-May 2016. The significantly improved 4.522 kilometre circuit now boasts a longer straight, ending in a new complex of challenging corners that aim to recreate the excitement of the original Kyalami. The width of the circuit has been increased in certain areas, runoffs improved and safety systems completely overhauled in line with FIA regulations. 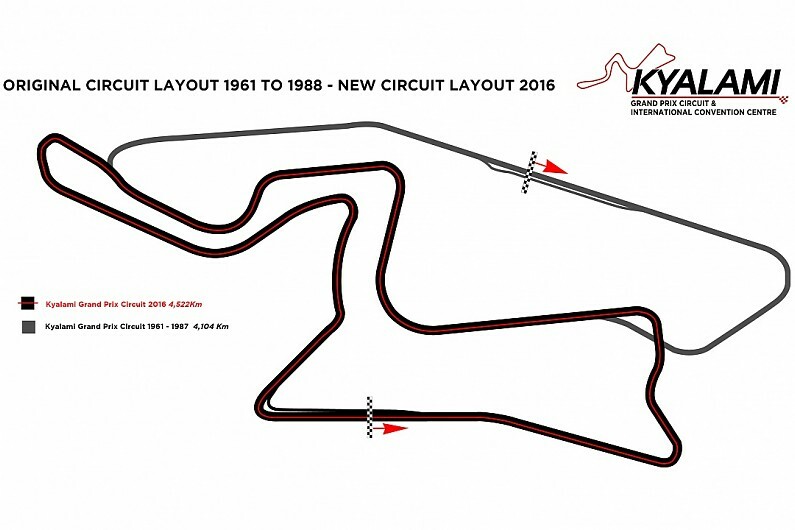 Kyalami retains a section of the original layout built in 1961 and iconic corner names such as Crowthorne, Jukskei, Barbeque and Leeukop make a welcome return. The Crocodiles, Cheetah and Ingwe (the Zulu word for leopard), debut as new corner names. Following its construction in 1961, the original Kyalami soon became an international destination, hosting 18 Formula 1 Grand Prix from 1967 to 1985. The annual 9 Hour endurance race, held in November of each year, attracted international teams and drivers, providing a thrilling spectacle for local race fans. Great drivers such as Jim Clark, Jackie Stewart, Niki Lauda, Nigel Mansell, Jacky Ickx and Alain Prost raced and won at Kyalami. After various changes to the circuit layout and the final 2 Grand Prix in 1992 and 1993, Kyalami slowly slipped from international focus. At an auction in July 2014 Kyalami was purchased by well-known Porsche entrepreneur and racing driver, Toby Venter. Plans for major upgrades were announced in May 2015. 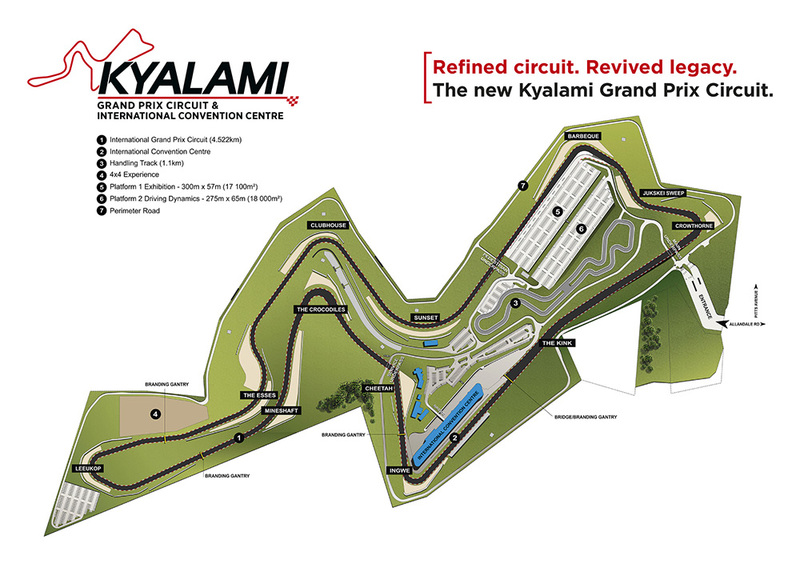 What emerged was an extensive redevelopment plan for Kyalami, representing the single largest upgrade in the 55 year history of the facility. Alterations include changes to the layout, a complete resurfacing of the circuit, upgrade of all circuit safety to comply with FIA requirements, improvement of all spectator areas and facilities, as well as major refurbishments to the pit building, which now includes a world class conference and exhibition centre. Kyalami is ideally situated in the growing metropolis between Johannesburg and Pretoria. The International Convention Centre offers ample parking, ease of access and spectacular views, adding to the appeal of Kyalami as the preferred destination for premier events. Focus has also been placed on providing excellent event support services to ensure a premium visitor experience. The new driving dynamic area which includes a multi-functional platform, skidpan and 1.1 kilometre handling circuit will provide a unique facility for advanced driver training. A challenging off-road training facility will also be available, adding to the variety of activities available at Kyalami. The venue is proud to announce that the SA Festival of Motoring organised by South African Shows Messe Frankfurt in partnership with NAAMSA will be hosted at Kyalami from the 31st August until the 4th September 2016. The South Africa Bike Festival organised by Clarion Events UK will be staged from the 27th May to the 29th May 2016. A date for the opening race meeting is yet to be finalised and will be announced in due course. 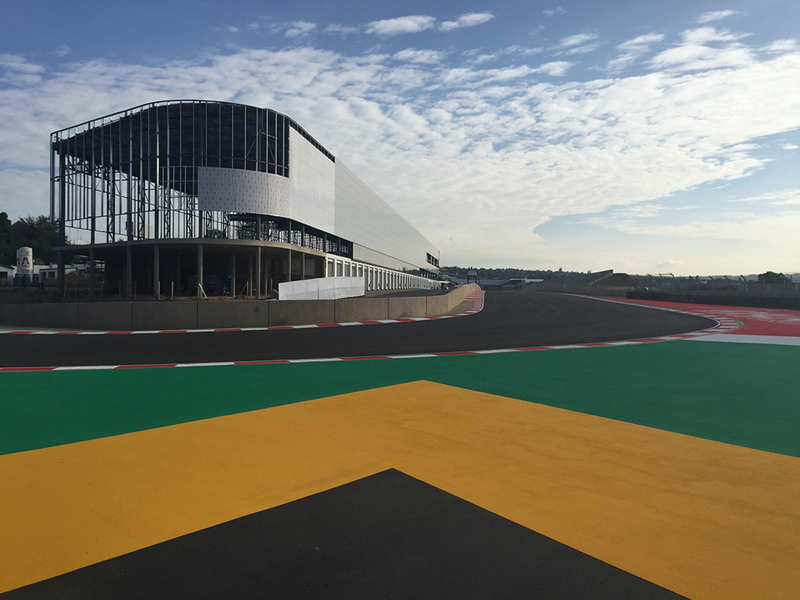 The Kyalami Grand Prix Circuit has once again taken its place as the premier motoring and motorsport facility in Africa, as well as a leading conference and event venue. A new chapter in the Kyalami legend has begun!!! !